We are the manufacturer of Wood Plastic Composite cladding panels, we can do the best work with best quality. Our organization is engaged in providing a vide range of ACP Front Elevations. The provided item is designed with atmosphere using high grade raw material in order to maintain its compliance with internationally set standards. This item is thoroughly examined on a series of parameters to ensure its alluring design and optimum quality. Enchanting, environment friendly and ageless: that’s what the Zinc Aluminium Composite Panel is all about. The Zinc Series from Aludecor is a quality product that will win over the hearts of architects and facade consultants for sure. 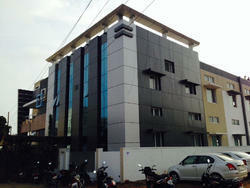 Offering ACP Cladding Services in Chennai, Tamil Nadu. Read about company and get contact details and address. Aluminum Composite Panel Cladding (ACP) is a widely-used term, describing flat panels that consist of thermoplastic core bonded between two aluminum sheets. ACPs are frequently used for external cladding of buildings (building facades). The main advantage of ACP is that, it is very rigid and strong, despite of its light weight. ACP Cladding is new format for building, office all decoration. “ Pratap Group is one of the leading manufacturer of Pratap Bond Aluminum Composite Panels. We an ISO 9001:2008 company of brings you Aluminum Composite Panels manufactured with the latest technology and infrastructure at Kolkata, West Bengal to meet the demand of quality Aluminum Composite Panels for both exterior and interior of the building in wide range of color and sizes.